During the Mars rover Opportunity's 1,291st Martian day, or sol, it took a toe-dip into Victoria Crater. All six of its wheels rolled down the inner slope, but a sensor indicated its front wheels had slipped more than an allowable 40 percent. This view shows the wheel tracks created by the short dip into the crater at "Duck Bay." NASA's Marsrover Opportunity finisheda planned "toe-dip" into anancient martian impactcrater and encounteredsome slick terrain along the way. The drive is the robotic explorer'smost significant foray after weeks-long dust storms threatened to shut it down. The robot drovein and thenbacked outof the crater Tuesday at Duck Bay, the most gradual and rover-accessible entrypoint into the 2,625-foot-wide(800-meter) crater at Meridiani Planum. Mission managers hope to sample exposedlayers of rock along the crater rim for the best glimpse ever into Mar's geologicalpast. Opportunity radioed home information about theadventure, letting mission managers know that it drove far enough in--about 13feet (four meters)--to get all six wheels past the crater rim for the firsttime. It then backed uphill for about 10 feet (three meters) to retreat from thescheduled dip. In spite of Duck Bay's gentle incline, the rover's wheels encountered excessive slippage, according to a NASAstatement. Like a car spinning out on a dirt road, Opportunity's front wheels slipped more than the allowable 40 percent at the edge of thecrater. Mission managers are still determining whether the loose groundis serious enough to prevent Opportunity from carrying out its long-delayed task at the crater. 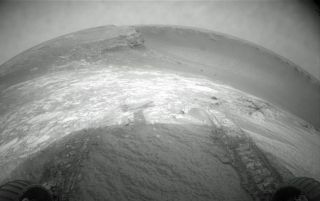 "We willdo a full assessment of what we learned from the drive [Tuesday] and use thatinformation to plan Opportunity's descent into the crater," said JohnCallas, rover project manager at NASA's Jet Propulsion Laboratory in Pasadena, Calif.